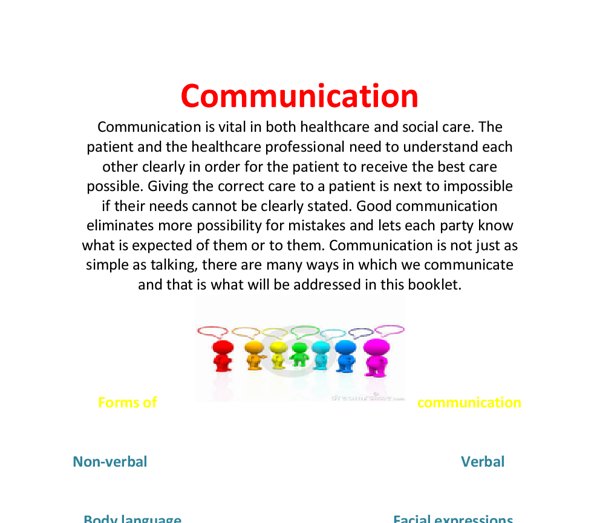 ﻿Communication Communication is vital in both healthcare and social care. The patient and the healthcare professional need to understand each other clearly in order for the patient to receive the best care possible. Giving the correct care to a patient is next to impossible if their needs cannot be clearly stated. Good communication eliminates more possibility for mistakes and lets each party know what is expected of them or to them. Communication is not just as simple as talking, there are many ways in which we communicate and that is what will be addressed in this booklet. 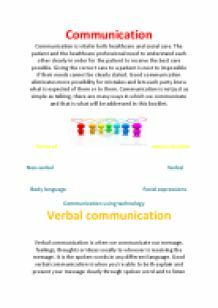 Forms of communication Non-verbal Verbal Body language Facial expressions Communication using technology Verbal communication Verbal communication is when we communicate our message, feelings, thoughts or ideas vocally to whoever is receiving the message. It is the spoken words in any different language. Good verbal communication is when you?re able to both explain and present your message clearly through spoken word and to listen carefully to the other person or people. Talking ? Is when we use our mouths to speak to other people, a person, an animal or even to ourselves. ...read more. Leaflet ? A sheet of paper usually folded containing information or advertisement. Facial expressions Communication through facial expressions is non-verbal communication with the face usually expressing emotions such as happiness when we smile, or sadness when we cry, we may even frown when we?re annoyed or angry. You can tell by a person?s eyes if they are tired, depressed or if they are listening and paying attention. You can even tell if someone is lying by their eyes. Winking ? Is the closing and opening quickly of one eye usually a signal of affection or greeting or to indicate something is a joke or secret. Pouting ? Push ones lips or bottom lip forward as an expression of sadness or to make oneself look more attractive. Glare ? a stare in a fierce or angry way. Eye contact ? The state of two people who are each aware of looking into each other?s eyes usually a sign of love. Smirk ? A smug smile in an irritating or silly way Happiness ? Feeling and showing contentment or pleasure through the face. ...read more. Communication using technology Communication using technology is sending your messages and thoughts or interacting with others through the use of technology such as a mobile, computer, television, radio, fax machine, web cam etc. There are many different ways of communicating through technology, verbally through phone calls, non-verbal maybe a messenger, through email or texting, with body language through web cam or digital photos and advertisements. Some of the popular uses are sites such as Hotmail, Facebook, Skype, Whatsapp and many more. Technology can even be an aid for the disabled like with the famous professor Stephen Hawking who uses a voice box that turns written words in to speech using small movements. Texting ? Sending a text through use of mobile phone. Phone call ? Using a phone or mobile to call someone in a distance place. Email ? The e stands for electronic. A user can compose a message through a worldwide communication system on a computer. Social networking ? Using a dedicated website to communicate informally with other users posting messages, pictures, games etc. Chat sites ? A special web site that lets users have conversations at the same time. Video chat ? Allows you to use audio and video to chat in real time at different locations. ...read more. An excellent piece of work evidencing good knowledge of the various types of communication. A variety of examples were given (although they could have been more relevant to social care) and the work was very nicely presented and structured. I would simply advise that there were a few odd grammatical errors that could no doubt be eliminated by careful proof-reading. A good introduction would be beneficial as it would allow the reader to understand the purpose of the essay. Greengables wouldn't receive as much money as they need or want and it wouldn't reach the standards that the government want and could be shut down until improved. osteoporosis, anaemia Under nutrition is inadequate consumption of food e.g. anorexia, bulimia Over nutrition is over consumption of foods, e.g. obesity, CVD, diabetes. The seven diet related diseases are: � Cardiovascular Disease � Type 2 Diabetes � Colorectal Cancer � Obesity � Osteoporosis � Anaemia � Dental Decay Cardiovascular disease includes all diseases involving the heart and blood vessels. Family will have left home. One partner may die. Children become independent, emotional support needs to come from other people. Reduced ability may result in low self-esteem and self-worth. Hierarchy 12. Hierarchy is a theory in psychology made by Abraham Maslow, it was proposed in the year 1943 13. "A Theory of Human Motivation". post stick notes reminding them to do something and jogging there memory. To get these adaptations and advise the individual would contact there Occupational Therapist who will advise them on equipment and strategies hat can help them with everyday activities. It is a branch of complementary therapy that puts a strong emphasis on the musculoskeletal system. It is believed that osteopathy treats and allows the body to heal itself. Therefor conventional medications are not needed in regards to the structure of the body.